Nineteen years after her death from cancer, Marshall Islander Darlene Keju has been honored in Taiwan with the Global Love of Lives award from a Taipei non-profit foundation. The Chou Ta-Kuan Educational and Cultural Foundation is honoring 19 people from around the world in an annual ceremony launched 18 years ago following the death of the foundation’s namesake, a Taiwanese boy who died at 10 from cancer. Keju exposed a United States cover up of nuclear test-caused health problems in her islands and later formed the internationally recognised non-profit group Youth to Youth in Health in the Marshall Islands. She was represented in Taiwan by Marshall Islands Journal newspaper editor Giff Johnson, her husband of 14 years. The Chou Ta-Kuan Foundation described Keju as “the Environmental Godmother” of the Marshall Islands who revealed the story of the 67 US nuclear weapons tests at Bikini and Enewetak to protect the safety and health of Marshall Islanders. Despite Keju’s death in 1996, the youth health organisation she established continues “providing Marshall Islanders with healthcare services and youth leadership training programmes,” said the foundation. Darlene Keju’s life story, by her husband Giff Johnson. 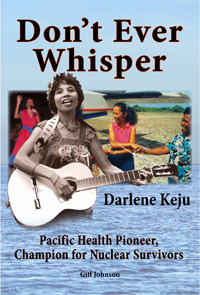 Giff Johnson published a biography of Keju in 2013 titled, Don’t Ever Whisper — Darlene Keju: Pacific Health Pioneer, Champion for Nuclear Survivors . Keju is the only Pacific islander in the group that is being honored. “It’s sad to say that the US nuclear test legacy continues to this day unresolved and that’s one of the reasons why her advocacy 30 years ago is still relevant now,” he said. Johnson said Darlene had a tendency to jump in on issues that others were ignoring. “She definitely was a pioneer in getting out ahead of the curve and bringing people along,” he said. He said a priority for Keju was in “developing the skills of young people to be advocates and to get out and do work for other people”. In addition to Keju, the winners of the foundation’s award this year are from South Korea, Norway, Turkey, Ecuador, China, Belgium, Japan, Germany and Taiwan. They are active in a range of peace, climate, education, health, human rights, and artistic projects. The 19 recipients were chosen from 2341 applicants from around the world. During their visit to Taiwan this week, they will share their stories with high school students, meet with President Ma Ying-Jeou and the mayors of New Taipei City and Taichung City, and visit with children in local hospitals to share messages of hope. SHENZHEN, China -- The government of the British Virgin Islands has indicated that it is ready to continue to working with China in the deepening of business relations between the two countries. This was highlighted during the recently held Qianhai-British Virgin Islands (BVI) Cooperative Development Forum in Shenzhen, China, on May 26. The forum was hosted by deputy directors-general of Qianhai Authority: Li Qiang, Peng Shuping, and Tian Min, who provided updates on Qianhai’s latest developments, achievements and future plans. Over 200 financial practitioners and enterprise representatives participated in the forum, which was themed, “Development for cross-border finance under new economic circumstances.” Topics related to the BVI business opportunities, legislation, and Qianhai-BVI cooperation were widely discussed. Director of BVI House Asia, Elise Donovan delivered the keynote speech titled, “The BVI – Your International Business Partner”, and introduced the British Virgin Islands financial services and advantages. The director listed the advantages of using BVI company structures and the diverse usage of BVI companies in asset protection and wealth/fund management and showed the BVI is ready to work with China to deepen bilateral relations and open a new era of future success. A panel discussion titled “How to promote the interaction and development of Qianhai and BVI cross-border financial business” was held and the panel explored the topics of cooperation between Qianhai and the BVI. The British Virgin Islands is ranked as the leading offshore financial jurisdiction in the Global Financial Centres Index, and China continues to be the territory’s important partner in Asia.